The October margin debt statistics have drawn quite a stir, and for good reason. Depending on how you look at it, margin debt data can provide useful signals on the changing risk vs. opportunity outlook for the market, and as alluded to in the title, a warning sign is near flashing. This chart appeared in a report on US cyclicals vs. defensives, which outlined some of the key downside risks for the US stock market. The chart shows margin debt expansion/contraction against the S&P500. Specifically we’ve got the year over year change in the FINRA aggregated margin debt figures. 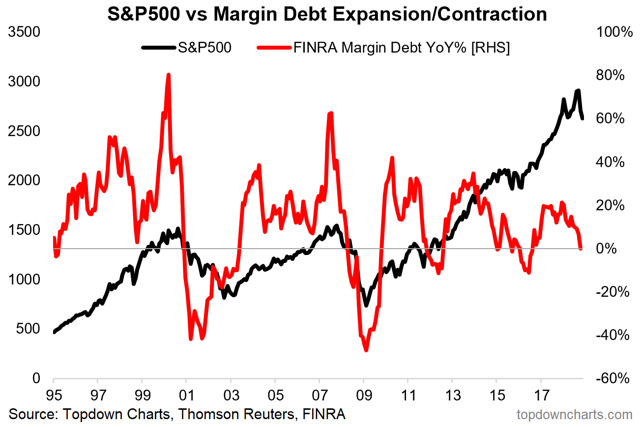 I’ve previously referred to this as margin debt acceleration (deceleration). This indicator is overlayed against the S&P500, and there’s a few immediately apparent observations. Basically there’s two types of potential warning signs in the period we look at here: 1. where margin debt growth accelerates to an extreme pace of growth (basically investors furiously putting margin debt to work to try leverage up returns) e.g. 2000 and 2007; and 2. where margin debt starts contracting on a year over year basis (as investors hurriedly liquidate leveraged positions – either by choice or by margin call!). While we did not see the extreme acceleration in margin debt at the January peak, the growth rate has fallen to zero (well -0.03%, to be precise) year over year. In the absence of the extreme acceleration at the peak (like 2000 and 2007), there is the possibility that it’s a false signal of a bear market e.g. 2012 and 2016. But nonetheless, it’s fair to say we can call this at least a yellow light, if not a red light, from the standpoint of traffic lights. Previous articleS&P 500 Stuck In A Trading Range For Another 8-Months?